Children love scarf play! 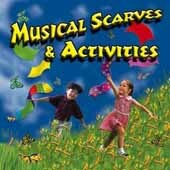 Using scarves can teach important concepts, enhance motor skills, help children to express creative movements, and it's fun too! 14 popular, classic songs feature narration and lyrics. You can create a rhythmic, visual treat with colorful scarves on the move! Offer scarves made from a variety of textures and lengths of fabric to use with these creative activities. Georgiana Stewart has created the activities for this imaginative recording which can be used in group settings and for individual use.